With plenty of room for up to 14 guests, your expansive, welcoming villa is 5 minutes from Disney and 20 minutes from Universal Studios and Sea World. Start with breakfast on your private poolside lanai, then spend the day exploring every whimsy and ride Disney has to offer before the famous nightly fireworks. The nature lovers in the group can take a day trip to Cocoa Beach or Clearwater Beach, it’s about an hour’s driver or swim with manatees in Crystal River. Keyless check-in and check-out makes your Orlando stay as breezy as it should be, and if you’d rather hang at home than the Windsor Hills clubhouse, the private heated saline pool and spa or your covered lanai is likely the best place to do so. Older kids have their choice of two fun bedrooms: the Mickey and Flower bedrooms are whimsically decorated and furnished with two twin-size bed sets. Each of the six bedrooms are equipped with their own Netflix-ready TVs, too. Sleep like those in the Magic Kingdom do in the master bedroom, detailed with a handsome four-poster super king-size bed and an opulent en-suite bath with double sinks, a soaking tub, and a walk-in shower. Another heavenly super king-size en-suite awaits on the second floor, along with a 3rd super king bedroom and a bright shared bath. You'll also have a super king-size bedroom and guest bath on the first floor, offering stair-free access - perfect for grandparents or guests with disabilities. During your stay, you're not only minutes from Disney but close to lots of restaurants (TGI Fridays, Carraba’s Italian Grill, Cracker Barrel, Outback Steak House, IHOP & Denny’s) & shopping (Target, Publix, 7-11 & Walmart). It’s centrally located for you and your family to enjoy all that the Disney area has to offer. - Lush Green Hedges around the Pool encloser for Added Privacy. We love to travel as a family and have become devoted vacation home renters. From Florida to France, from the moment we had our first vacation rental experience in OBX, we were hooked. It was such an intimate & happy experience for our family and we still have lasting memories from those trips. Vacation rentals are now the only way we travel and wanted to also pass on that experience to families staying in our Villa. We chose Windsor Hills vacation resort because of how close Windsor Hills (2 miles) is to Disney and how established The Windsor Hills community is. The villa is also one of the closest private houses to the clubhouse and all of the Windsor Hills amenities are just a short walk away. The pool was recently converted to a salt water pool. The saline is much better for your health, reducing skin and eye irritations. For the sun worshipers, the house offers plenty of sunlight throughout the day. The Pool faces south-west, getting sun starting around 10:30am and lasting until sunset. We love to enjoy the fantastic Florida sun by the pool. Villa by the Castle is professionally managed and owner operated to provide our guests a more personal experience. It has a heated saline pool & spa, large covered lanai, 70 inch 3D HD LED TV, 3D BluRay Player, XBox One With Kinect, a play station 2 in the Mickey room and flower room, an LED TV (either 32' or 40') and Blu-ray player in every bedroom. The brand new game room has just been completed and features an 8 foot professional pool table, air hockey and foosball table. The game room has wall to wall carpeting, air conditioning and heating. We have several pool games available FREE for your use including a pool-side basketball hoop. We have a lot of baby gear FREE for your use during your stay, including a high chair, pack n plays, a jogging stroller, crib, baby monitor, excersaucer, bed rails, a baby gate and a baby bottle sterilizer. During your stay you'll have use of a 4 burner stainless steal grill including propane free of charge. The villa is close to all that Windsor Hills has to offer, in fact the villa is one of the closest private houses at less than a 2 minute walk to the water slide! All bathroom are fully equipped with towels, wash cloths and a toilet paper roll is provided for your initial stay. Located in Windsor Hills, the closest vacation home resort to Disney, just 2 miles from the entrance. The villa is also one of the closest private houses to the Windsor Hills clubhouse, a 3 min. walk. All bed sheets and pillow covers are included. All the bedsheets, towels and pool towels have recently been upgraded. A brand new mega capacity washer is located in the villa's laundry room on the first floor. A brand new mega capacity dryer is located in the villa's laundry room on the first floor. high speed broadband Wi-Fi is available throughout the house. There's also an all-in-one PC with a 24 inch screen upstairs for your use. The professional fitness center is a short 2 minute walk from the house. There's a large living room in the front of the house that seats 6. It's open to the dining room and features a band new 55 inch LED TV and HD cable. A Bosch super quiet top of the line dishwasher - no need to rinse the dishes before putting them in the dishwasher. We provide the dishwasher pods so you don't need to go out and by dishwasher soap. The refrigerator is a full sized refrigerator with an ice maker. We have several board games, video game consoles (PS/2 and X-Box One), several pool games, a putting green, board games and a game room. Pandora enabled apps in every blu-ray player in the bedrooms, living room and great room. The tennis court is a short 4 minute walk from the house. As our guest you can rent tennis equipment at the clubhouse with refundable deposit. There are many golf courses to choose from, the closest is Mystic dunes right next door. There's a putting green in the community and the house has a putting green you can use at the house. Wow! Thanks for the fantastic review. It really made our day when we read it. We were thrilled that your family had a fabulous reunion. We’re so happy that the kitchen had all of the gear/utensils needed to make 3 birthday cakes at the house. We think that must be a new house record. We really appreciate all of your wonderful feedback. You were fantastic guests and we look forward to your next stay with us. Thanks for the five star review. We’re so happy you enjoyed the pool, hot tub & BBQ. Also, thank you for mentioning how clean the home was. Our cleaners will appreciate hearing that their work is being recognized. It was a pleasure having you and your family as our guests. We look forward to your next stay at Villa By The Castle! We’re so glad everyone had a wonderful stay and that you had all that you needed for your little one. :) We provide baby gear so that our guests can focus on having fun and relaxing during their stay. The saline pool has been a big hit with our guests lately and we’re so happy you enjoyed it. Thanks for the great review and for being such wonderful guests. Wonderful vacation at a VRBO, home was more than we imagined! This property had plenty of room for our whole family. The grandchildren & adults had a wonderful time in the pool in addition to the waterpark and movie theatre at the Villa. We were very thankful for all the baby items that were available so my daughter didn't have to haul extra things with her. The pool toys came in handy for the grandsons enjoyment while in the pool also. Steve & Sandy were great in answering all our questions before we arrived and keeping us informed up til the time we got there & after. Had a quick check-in with both my husband & I and our kids when they arrived from the airport late at night. The welcoming package that was at the house was greatly appreciated. The location was very convenient for our agenda in going to the parks, ocean and gulf. The house had everything we needed for cooking, laundering and playing. The game room was enjoyed by all the family too. We would definitely give Steve & Sandy a call at staying there again in the future for another family vacation! Thank you so much for taking the time to review your stay with us. We are delighted to hear that you had a great time. Glad the baby gear came in handy We’re looking forward to your next stay with us! The house was great, it had SO much stuff - I over packed (having 3 little boys I wanted to be prepared) and the house was incredible. The owners were amazing to work with and so attentive the entire time. We had an issue with a crib mattress not being in the house - someone previous must have damaged or removed it from the house - and they immediately ordered us a new one and offered to rent us a crib until the mattress arrived. We arrived to some grocery essentials to get us started, soap and shampoo starters... they also provided garbage bags, dishwasher and laundry detergent - a lot of little things other homes do not provide. The beds were comfortable too! Thanks for the wonderful review. It was truly a pleasure having you and your family as our guests. We’re thrilled that you enjoyed your stay and that you were able to enjoy the little extras that we provide for our guests. We look forward to welcoming you back on your next Disney vacation! 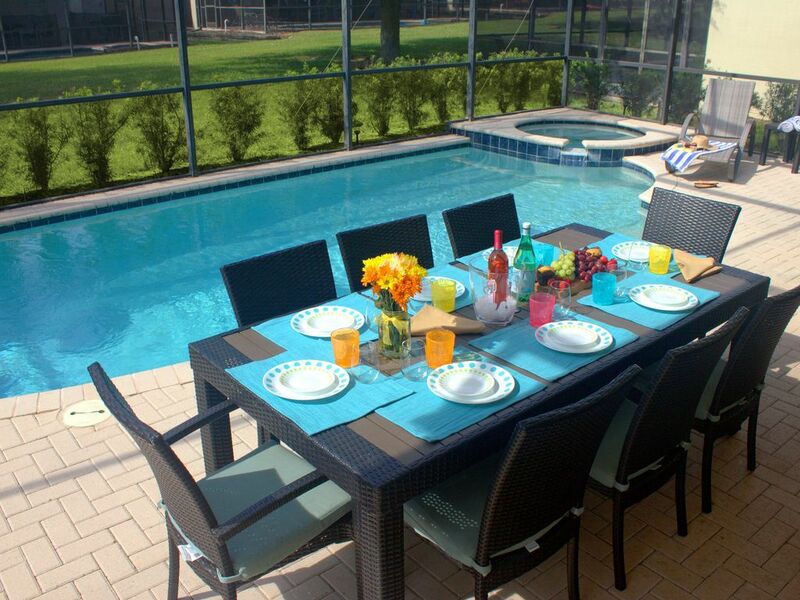 Windsor Hills is a resort style community that is unparalleled in the Orlando/Kissimmee area. Windsor Hills is a gated resort with 24-hour security. Some of the magnificent features of this community's amenities include a luxurious water park pool with fountains, a two story water-slide, spa, separate toddler pool, tennis, basketball and volleyball courts, and a putting green, arcade, fitness center, 48 seat Movie Theater as well as children’s playgrounds. You’ll enjoy access to a luxurious water park pool (double Olympic size) with fountains, water slides and a spa. The beach entry heated swimming pool is perfect for the little ones. While you are here, check-out the Windsor Hills resort events that take place at the pool or at the Clubhouse. The events calendar can also be found at the Welcome Center. Windsor Hills is a 5 star resort that has been a top favorite locations for guests looking to enjoy their family vacation at Walt Disney World. Located just off highway 192 west of Walt Disney World and only 2 miles from the Disney gates, you will be just minutes from Magic Kingdom, Epcot, Animal Kingdom, MGM Studios, & Downtown Disney. There is also a shuttle service to the Disney Parks for those who prefer not to drive. In addition to Walt Disney World being less than 2 miles away, Universal Studios, Wet 'n Wild and Sea World are also close by – about 15 minutes away. There is also a vast assortment of golf courses, shopping, Restaurants and dining options nearby. In fact one of the best golf courses in Florida, Mystic Dunes Golf Club is right next door to Windsor Hills. Windsor Hills Resort's has the convenience of being close to everything the area has to offer but still offers you the ability to get away from it all once in the Resort. It's truly the best of both worlds. No Additional Fees for Pool & Spa Heat, BBQ / Propane Use & Baby Gear. All is included free of charge with your stay.